Day 1 Delhi/Jaipur: Morning departure from Delhi as you travel by road to Jaipur (approx 5 hours drive). You will stay at the Taj Jai Mahal Palace which enjoys a central location close to historical monuments and the main shopping centre. Known as the Pink City, due to its brightly-painted buildings Jaipur is an enthralling city with lots to see amidst its colourful streets. 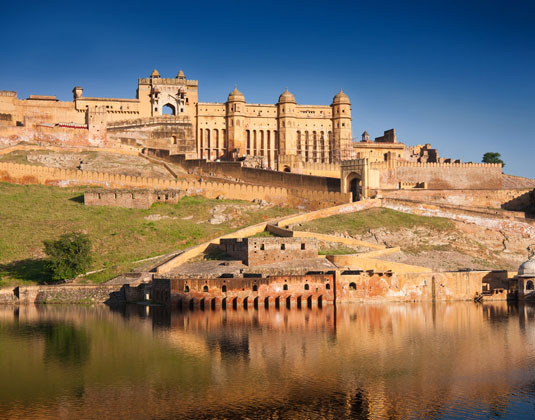 Day 2 Jaipur: Today’s sightseeing includes the fairy-tale grandeur of Amber Fort which dates back to 1592 and lies in the arid hill country surrounding the city. Later you will embark on a city tour which includes the City Palace; the Jantar Mantar (royal observatory) and the intricate Hawa Mahal (Palace of Winds) which was constructed in 1799 to enable ladies of the royal household to glimpse life in the city. Day 3 Jaipur/Delhi: Transfer back to Delhi by road. Set amidst 18 acres of beautifully landscaped Moghul gardens, this palace dates back to 1745 and is a magnificent piece of Rajasthan’s heritage. The 100 guest rooms feature antique furniture, miniature paintings and stylish bathrooms to give contemporary comfort with a regal touch. The swimming pool is perfect for a relaxing dip or perhaps you’d prefer some pampering at the spa. The hotel also has casual all-day eateries or formal fine dining, as well as a patiesserie and bar. Accommodation: In luxury rooms at Taj Jai Mahal Palace with air-conditioning, bath and separate shower, mini bar and safe. Upgrade options include ground floor luxury rooms with terrace. Tour price: The price shown is based on the best value travel dates in low season and includes return private road transfers between Delhi and Jaipur, 2 nights accommodation and sightseeing as shown.